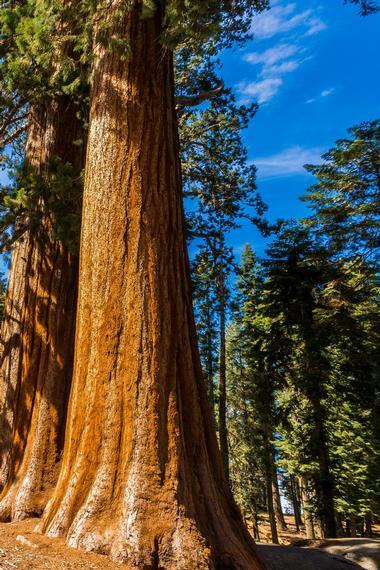 Many people know that redwoods are the tallest trees in the world, and these trees are what typically first comes to mind when one hears the name Redwood National and State Parks, California. However, the parks are much more than the redwoods. They also preserve oak woodlands, vast prairies, almost 40 miles of rugged coastline, and wild riverways. The verdant landscape of the parks has also been home to people for thousands of years. Redwood National and State Parks, CA, offer four developed campgrounds for visitors wanting to camp within the parks: Elk Prairie, Jedediah Smith, Gold Bluffs Beach, and Mill Creek. A campground guide is available the park's website to help visitors decide which campground is best for them. Reservations are required for camping and can be done through the California State Park system. The Elk Prairie Campground offers access to more than seventy miles of biking and hiking trails, cabins, and seasonal ranger-led programs. Campers here can also enjoy the sight of grazing black-tailed deer and Roosevelt elk in Elk Prairie, as well as ancient coast redwoods. Located in the magnificent grove of old-growth redwoods, the Jedediah Smith Campground provides cabins, fishing, swimming, seasonal campfire programs, and hiking trails. The Gold Bluffs Beach Campground is situated along the Pacific coastline, providing a secluded section of the beach, as well as seventy miles of biking and hiking trails. Visitors can also see Fern Canyon and grazing Roosevelt elk. 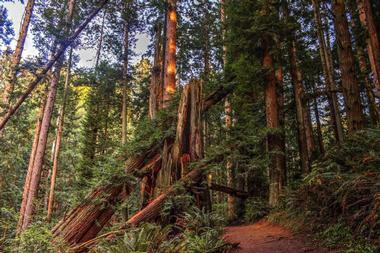 Towering maples, young coast redwoods, and adlers shelter the Mill Creek Campground. The campground offers several hiking trails, seasonal ranger-led programs, and access to Mill Creek. Visitors wanting to hike or camp in backcountry must get a permit in person from either the Kuchel or Hiouchi Visitor Center up to twenty-four hours in advance. Backcountry hiking and camping provides the opportunity to get away from everything and for hikers to have the trail to themselves. The Redwood National and State Parks contain eight backcountry campsites and over 200 miles of outstanding backcountry trails. The backcountry of the park can be explored by horseback, bicycle, or on foot, and features a broad array of natural habitats, including oak woodlands, redwood forests, prairies, marshes, streams, and pristine beaches. A variety of helpful backcountry resources can be found on the park's website, such as the Backcountry Trip Planner, mileage chart, and park map. Redwood National and State Parks offer many scenic drives through redwood forests, oak woodlands, upland prairies, and rugged coastline for visitors who are just passing through the area. The Howland Hill Road is a one-way, ten-mile, mostly unpaved road. 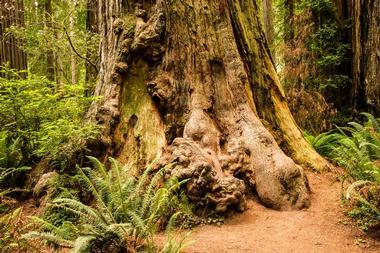 This forty-five minute drive, provides motorists with a close encounter with the famous, towering redwoods. There are several trailheads and pull-outs along the road, including Stout Grove and the Boy Scout Tree Trail. The Enderts Beach road is just a five minute, one-way drive from Crescent City, and offers beautiful views of the coast, whale watching, and elk viewing. The road also provides access to the trailhead for Coastl Trail, Crescent Beach Overlook, Crescent Beach picnic area, and Enderts Beach. 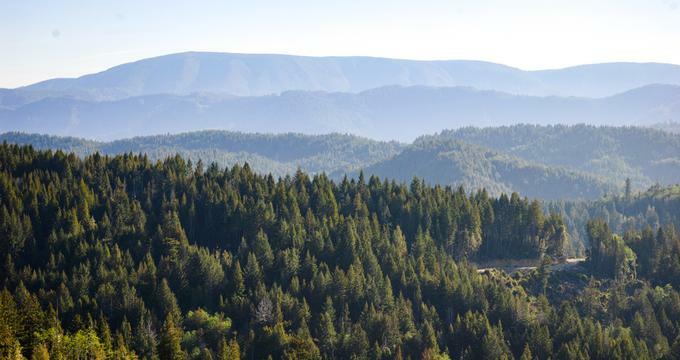 The 10-mile Newtown B. Drury Scenic Parkway is a great alternative to U.S. 101 as it travels through the center of old-growth redwood forest, part of the Prairie Creek Redwoods State Park. There are also many trailheads that can be accessed along the way. Cal-Barrel Road is about a thirty minute drive along an unpaved road. The narrow road winds its way through massive old-growth coast redwoods, that are also great to explore on foot. The extensive network of trails in Prairie Creek Redwoods State Park and the Rhododendron Trail can also be accessed from this road. Davison Road is another thirty minute drive that is mostly unpaved. The road passes through meadows where Roosevelt elk graze and a redwood forest on its way to Fern Canyon and Gold Bluffs Beach. A forty-five minute drive down Bald Hills Road will guide motorists along a steep grade through redwoods and open prairies. Trails to the Tall Trees and Lady Bird Johnson groves can be found in the old-growth redwoods section of the road. Wildflowers in the spring, black bears, and Roosevelt elk can be spotted in the prairies. 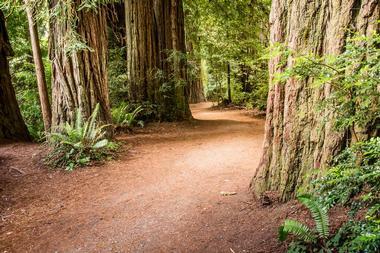 A hike along one of the many trails within Redwood National and State Parks can be peaceful and unforgettable. Walking among the redwoods during morning filled with fog can be an almost other-worldly experience. Often the only things hikers will hears is the sound of gurgling water as it trickles among the mossy rocks and ferns. Peace and stillness settle upon respectful visitors, as pockets of sun, somber mist hang about them like cobwebs. A trail network of over 200 miles winds through an array of environments, such as beaches, forests of old-growth redwoods, and open prairies. Visitors can talk to ranger at the visitor center, as well as pick up a trail map. Elevations along the trails within the Redwood National and State Parks vary from sea level to about 3,000 feet. Hiking and exploration year-round is possible thanks to consistent mild temperatures. The trails throughout the redwoods can often be slippery and wet, so it's best for hikers to bring good boots and raingear for their hike. During the winter months, the Trestle and Redwood Creek trails might be difficult to hike. In summer, temporary bridges make these trails easier to use, however, the bridges are removed in the rainy season. The Stout Grove can only be reached from the Jedediah Smith Redwoods State Park campground during the summer by seasonal bridges. There are numerous opportunities for visitors to the Redwood National and State Parks to view some of the area's resident wildlife. One of the most often spotted animals in the parks is the Roosevelt elk. The Roosevelt elk are the deer family's largest members. While they can be seen among just about any of the parks, they are most often spotted in Prairie Creek Redwoods State Park south of the Klamath River, in the Orick area, along Bald Hills Road, and Gold Bluffs Beach. Male Roosevelt elk can be identified from late summer to winter by their large antlers. The females, on the other hand, have no antlers and are smaller in size. While they may seem docile and safe to be around, the elk are unpredictable and wild animals. Visitors should remember to be careful, especially during the mating season in the fall and calving in May and June. Roosevelt elk should be observed from a safe distance. From November to December and March to April, visitors to the Redwood parks have the greatest chance of catching a glimpse of the gray whales while whale watching, as these are the peak migration months. On a calm, clear day, the Klamath River Overlook offers a visitors a possibility of seeing one the resident whales anytime throughout the year. Those wanting to do some whale watching should be sure to bring binoculars and keep an eye out for the whales' spouting. Other good spots for viewing whales include Wilson Creek, Gold Bluffs Beach, High Bluff Overlook, Crescent Beach Overlook, and the Thomas H.
Seabird and tidepool marine life viewing is also possible at Redwood National and State Parks. Visitors can views this wildlife by walking down the Coastal Trail for about half a mile from the Crescent Beach Overlook to Enderts Beach. Another good spot is Hidden Beach, which can be accessed via the one-mile Yurok/Lagoon Creek Loop. Visitors can also spot sea wildlife along Highway 101 at Wilson Creek. Tides schedules are available at the visitor centers throughout the park. The Redwood National and State Parks offer several activities and programs led by rangers from the middle of May to the middle of September. A schedule of activities can be found on the bulletin boards at campgrounds, information center, and posted on the calendar for the parks. Among these programs are the Junior Ranger Programs. These programs last about an hour and are designed for children aged seven to twelve. Kids will have fun as they learn about the animals, plants, life systems, and people of the redwood region. The Junior Ranger Programs are offered at the Prairie Visitor Center, Mill Creek Campground, and Jedediah Smith Campground. All information centers provide junior ranger activities that are self-paced. Another one hour program in the parks are campfire programs that may consists of storytelling, games, narrated slide shows, and/or music. The Elk Prairie, Mill Creek, and Jedediah Smith campgrounds are the perfect settings as the night sky covers the North Coast for an inspiring and informative night cap. The outdoor amphitheaters and campfire circles are wheelchair accessible, and campers should dress for summer's cool evenings. During part of the summer the parks also offer guided kayak tours along the Smith River, California's largest free-flowing river system. Participants will learn about and explore an array of topics as they paddle through the pristine waters, such as the Smith River's unique geology and how it helps the redwoods grow. 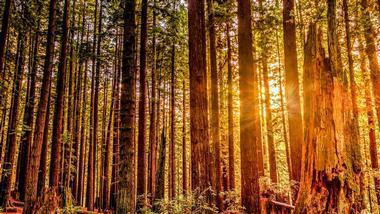 Park ranger-naturalists lead nature walks through the Redwood National and State Parks that explore the natural communities that contribute to one of the planet's most diverse ecosystems. These half an hour to an hour long walks allow visitors to immerse themselves in the prairielands, shores, and forests. Two-hour tidepool walks are also offered. During these walks, participants can get both their feet and hands wet as they discover the fragile tidepool creatures.